Todd Russell started strong in this June 1990 game. Then came the seventh inning, according to The Bend Bulletin. After he allowed no earned runs through the first six, Russell opened the door for six runs. Five of those runs were charged to Russell. "Gene and I felt he still had pretty good stuff," Bend Manager Mike Bubalo told The Bulletin, referencing his pitching coach Gene Dusan. "The first six innings he pitched pretty well." Russell took the loss in that game and in four others that year, his second as a pro. He went on to see time in one more season. He never made AA. Russell's career began in 1989, taken by the Athletics in the 28th round of the draft out of Pearl River Community College in Mississippi. Russell started with the Athletics in the rookie Arizona League. He went 6-5 over 13 starts, with a 3.39 ERA. He struck out 55 over 61 innings. He moved to short-season Bend for 1990. 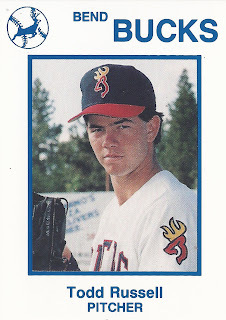 He went 1-4 over 15 outings 13 starts and ended with a 6.02 ERA He then played 1991 at single-A Madison. He picked up five wins over 19 relief outings and one start, with a 5.36 ERA to end his career.